This ox was purchased at The Year of the Ox gala. "Babe the Blue Ushi" was awarded Honorable Mention by our panel of Stampede Judges. Congratulations! “Babe the Blue Ushi” is a product of East meets West. From the West, Babe the Blue Ox, the beloved best friend of Paul Bunyan (as I was inspired by in my childhood). And from the East, the Japanese art of shibori, a dye process using indigo (a technique I am currently exploring as an artist); also, “ushi” translates to ox in Japanese. With this design, I used a combination of arashi, kumo, and itajime shibori techniques (resist dyeing) on cotton, which I then glued to the ox directly. 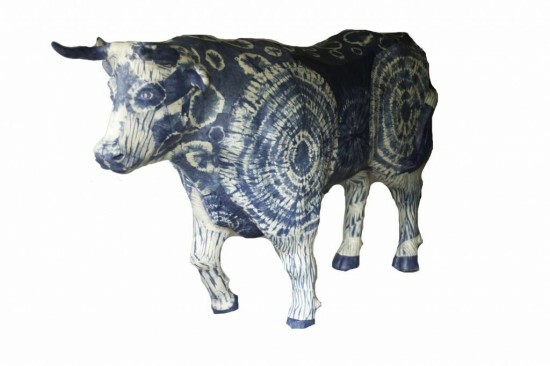 Indigo retains its color with exposure to UV light, so there is no worry of fading if the ox is outdoors (plus the automotive seal coat the ox received will protect the fabric further). I wanted to bring a childhood folk tale to life-sized proportions with this sculpture, perhaps inspiring a younger generation to enjoy the melding of American and Japanese cultures.